One of the most renowned female Kurdish fighters, known as the Kurdish Angelina Jolie, was killed in fierce clashes with ISIS in Syrian border town of Jarabulus. 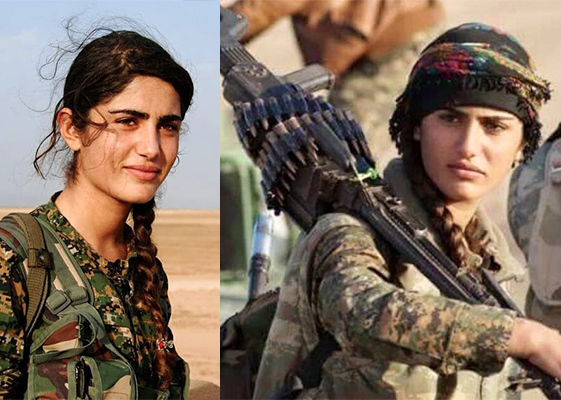 According to a report by Al Alam News Network, Asia Ramazan Antar, the 22-year old female fighter who is referred to as Kurdish Angelina Jolie in social networks due to her resemblance to the Hollywood superstar, was killed in action while fighting ISIS terrorists. She was born in Qamishli, a city in north-eastern Syria on the border with Turkey, and recruited into the Women’s Protection Units, which is an all-female Kurdish military organization to gun down ISIS militants. This is while the Kurdish sources have not confirmed her death officially so far.